This evening the Duke and Duchess of Cambridge took part in their first state banquet at Buckingham Palace. 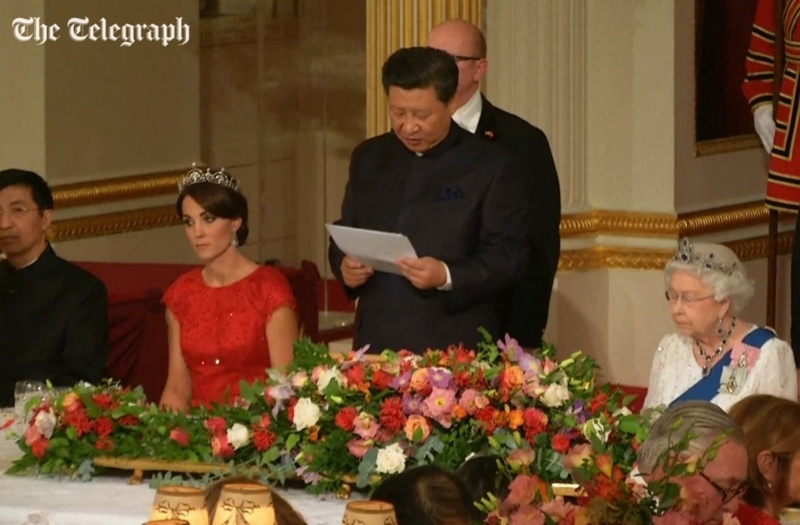 The function honors the President of China, Xi Jinping, and his wife, Madame Peng. Below, William and Kate arriving at Buckingham Palace. 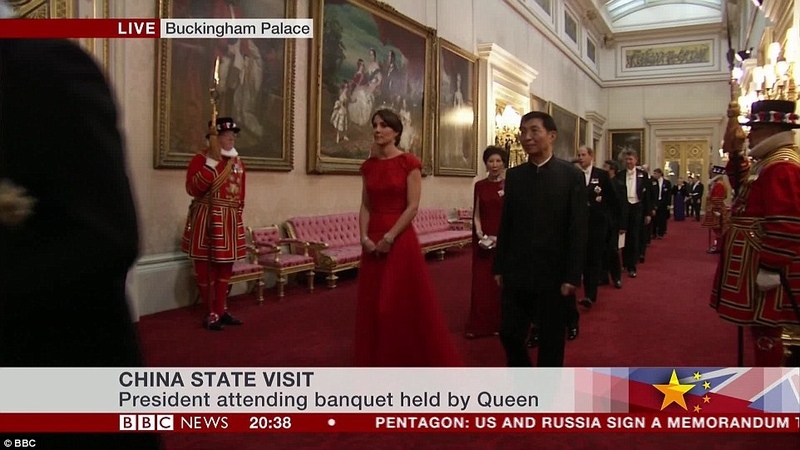 And the Duchess walking into the Palace ballroom, accompanied by Wang Huning, a leader of China’s Communist Party. 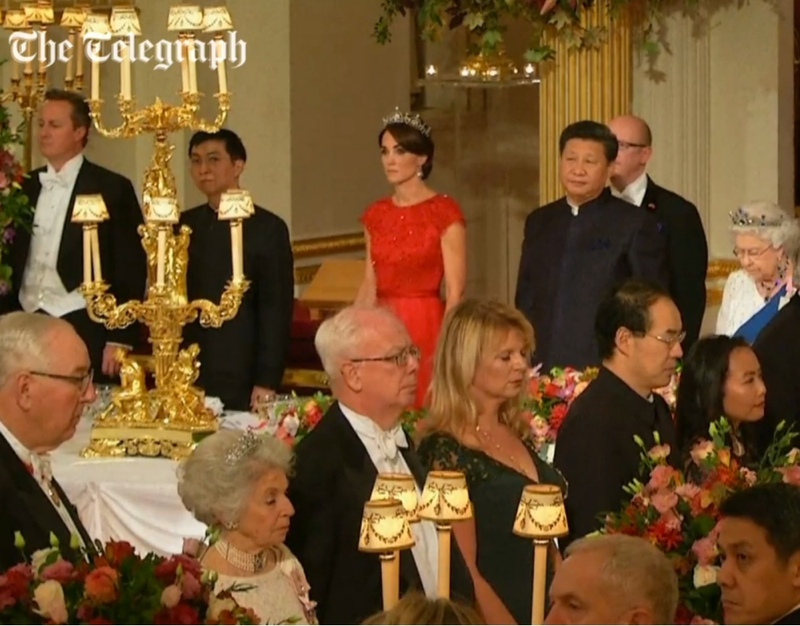 Guests stand for the national anthem, as seen in this screen grab from The Telegraph’s live coverage of the event. Four-and-a-half years after she became an HRH, Kate made her first appearance at what is considered a staple royal duty – dining in the opulent palace ballroom with 170 guests in honour of a visiting president. 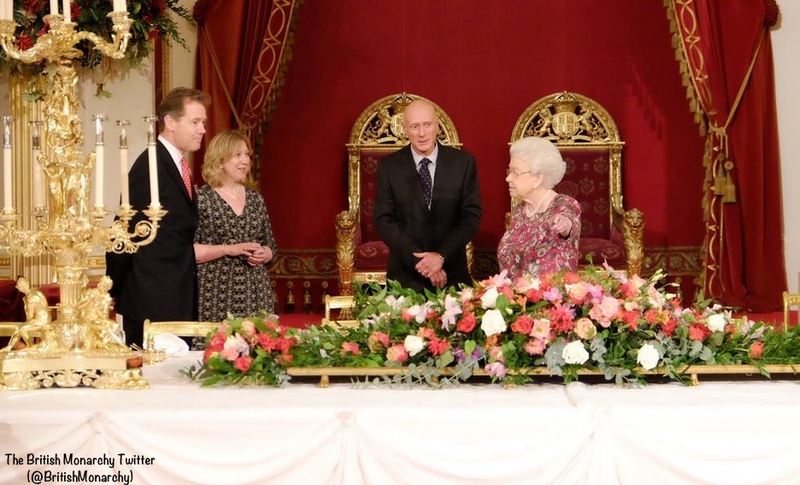 It was also the Duke of Cambridge’s first state banquet in the UK. The monarch, resplendant in a white tulle banquet dress embroidered with white and silver beads and diamanté sequins by Angela Kelly, made a speech welcoming the guests of honour. The Royal Order of Splendor notes HM was wearing the Modern Sapphire Tiara tonight. 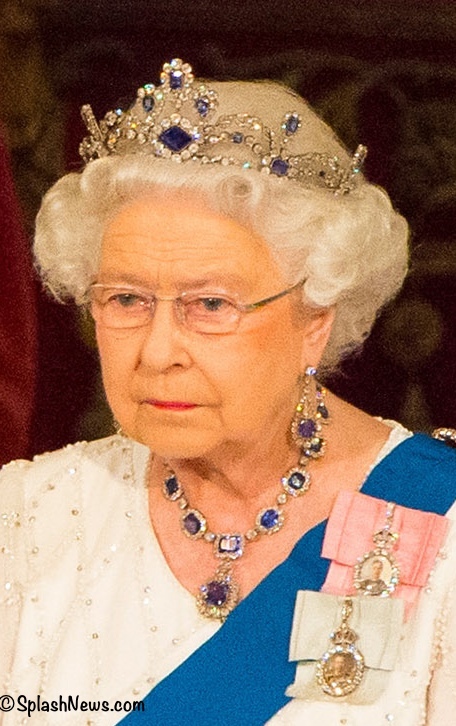 The diamond and sapphire tiara was commissioned by the monarch in either the 1950s/60S to be worn with the necklace of sapphires and diamonds she paired it with last night, a Buckingham Palace source tells PEOPLE. The necklace, which was made in 1850, was a wedding gift from her father, King George VI. The Queen has worn this “suite” of jewelry many times over the years. She was seated in the most prominent position for a female member of the royal family after the Queen – on the President’s right while the monarch, as is custom, sat on Mr Xi’s left. It was a magnificent scene at Buckingham Palace. 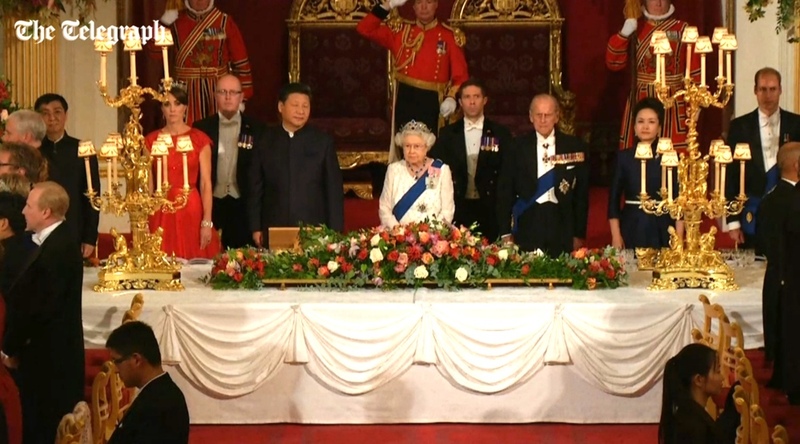 From left to right you see the Duchess, president Xi, Her Majesty, the Duke of Edinburgh, Madame Peng and Prince William. 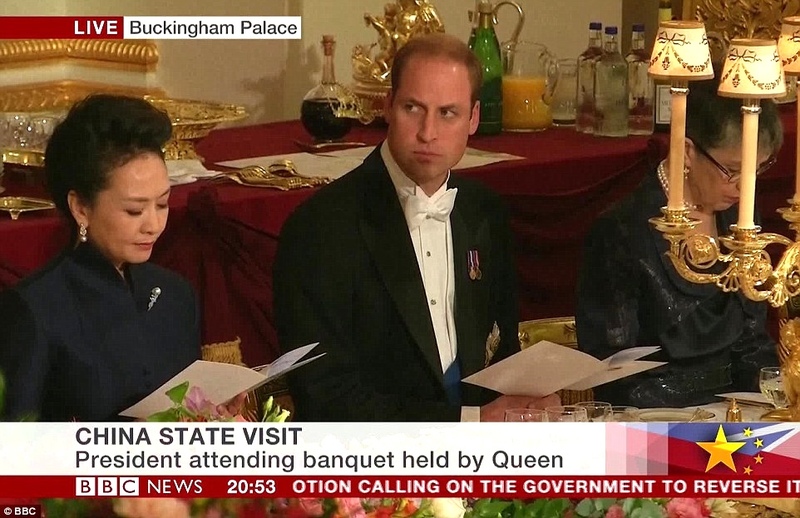 A closer look at Madame Peng and Prince William in this BBC screen grab via The Daily Mail. 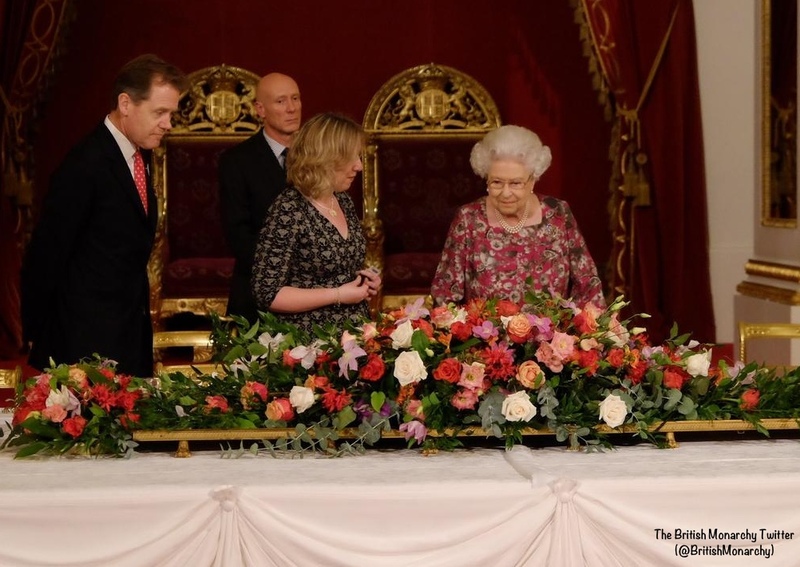 The magnificent ballroom had been decked out in splendid royal style for the 130 guests, including floral arrangements of white roses, pink carnations and clematis that originated in China. Among the blooms was a Sophie, Countess of Wessex clematis variety – her husband, Prince Edward, Earl of Wessex, was among the guests. The menu for tonight’s dinner. That translates into filet or turbot, venison from Balmoral, timbale of celeriac and butternut squash. 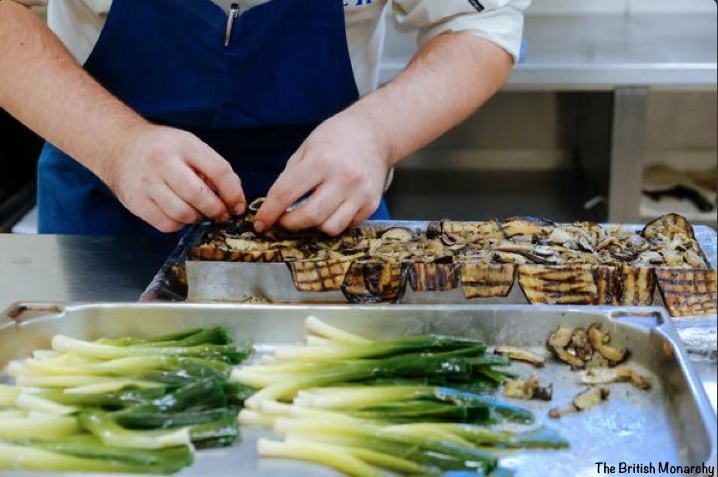 Below, Palace preparations for the evening’s meal. And other elements of the evening’s plan. 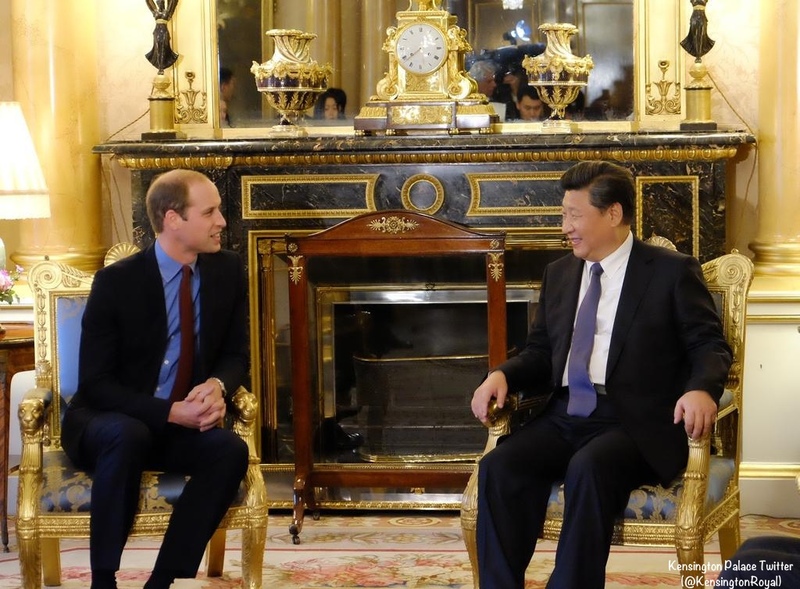 Prince William had seen President Xi earlier in the day, meeting with him at Buckingham Palace. 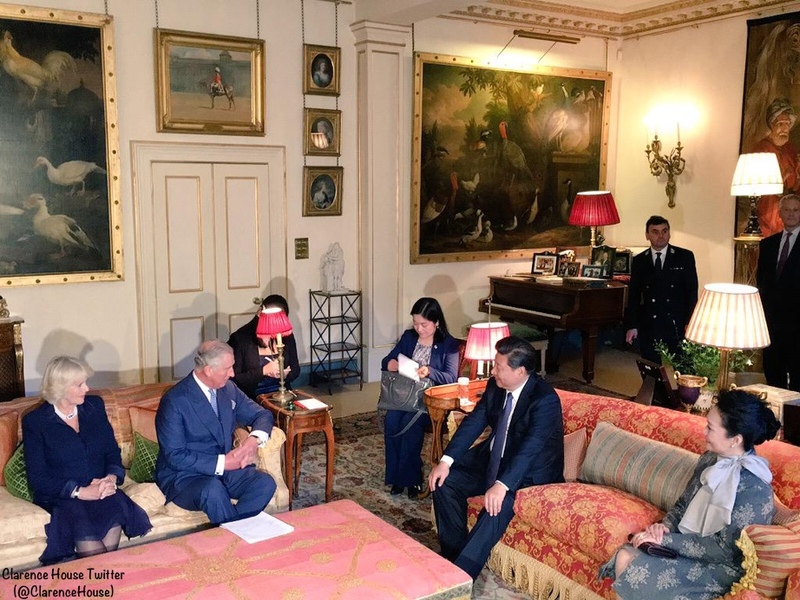 This is William’s second meeting with the President, you may recall the Duke visited China in March of this year. The sun was shining on the Mall for the official welcome of President of The People’s Republic of China and Madame Peng Liyuan, an event heralded with the pomp and pageantry associated with a state visit. Below you see the Band of the Household Cavalry, part of the morning’s ceremonies. 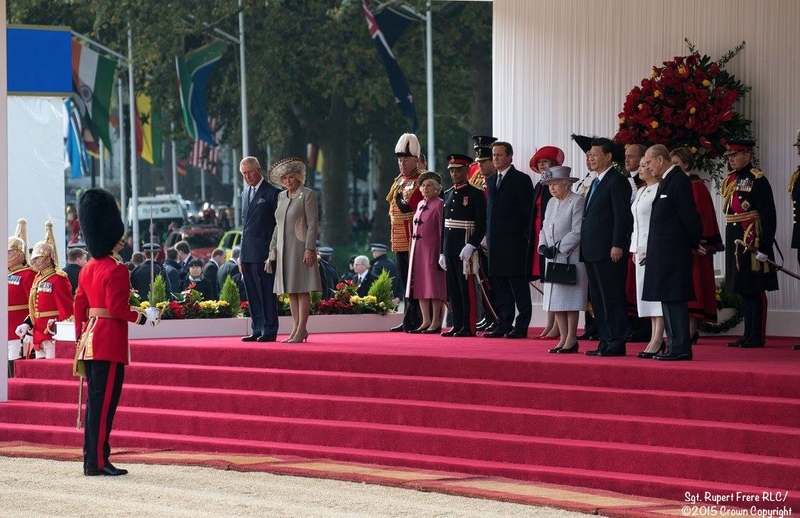 HM, the Duke of Edinburgh, the Duke and Duchess of Cornwall, the Prime Minister, Senior members of the Cabinet, the Lord Mayor of London, the Mayor of London, and Defence Chiefs of Staff welcome President Xi and Madame Peng. 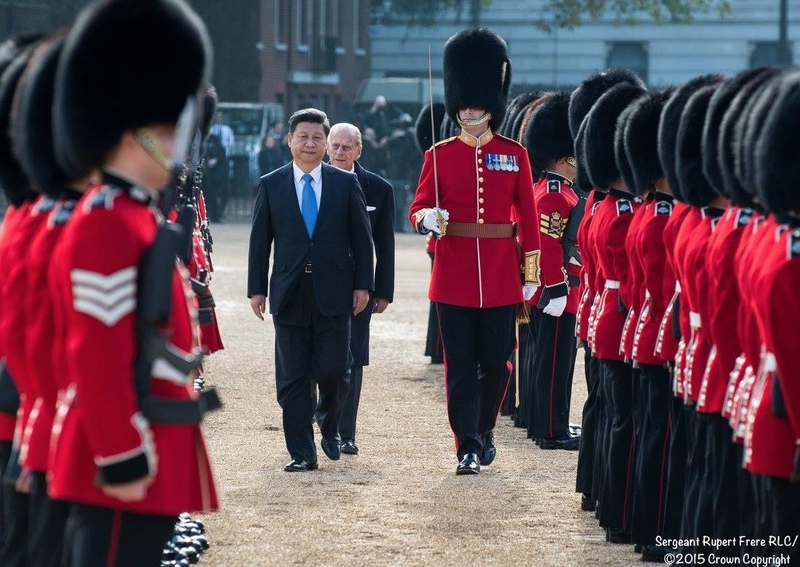 President Xi and the Duke of Edinburgh inspect troops from the 1st battalion Grenadier Guard, accompanied by Major Benjamin Jesty. 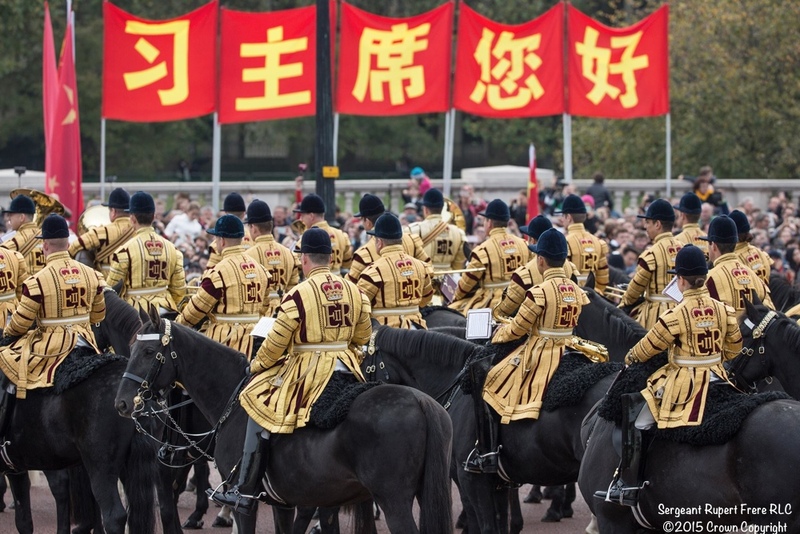 HM officially welcomes the President of the People’s Republic of China to Horse Guards Parade. Her Majesty was in a coat by Stewart Parvin and a hat by Rachel Trevor Morgan for the morning’s ceremony. A brief video of President Xi and HM exiting the Diamond Jubilee State Coach. Following the official welcome President Xi delivered an address to Parliament. There was a formal lunch at Buckingham Palace, and later the president joined Prince Charles and Camilla for tea at Clarence House. On now to what Kate wore for her first state banquet at Buckingham Palace. 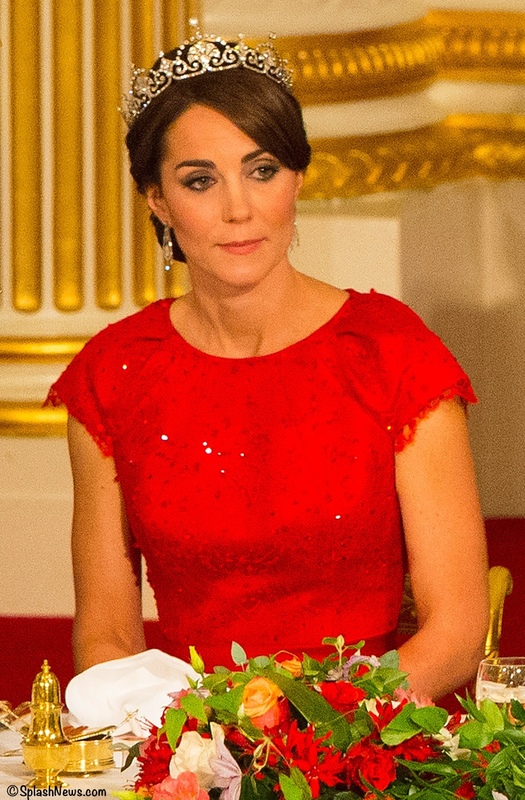 The Duchess was in a rich red Jenny Packham design, a bespoke piece created for tonight’s dinner. The color of the dress is a nod to the significance of red in the Chinese culture, symbolizing joy and good fortune. Of course, red is also the color of the Chinese flag. The gown features cap sleeves, what looks like a sequin and lace bodice, satin belt or waistband and a full skirt. Patricia Aviero suggested Kate’s dress has elements of the frock below from the autumn/winter pre-collection. 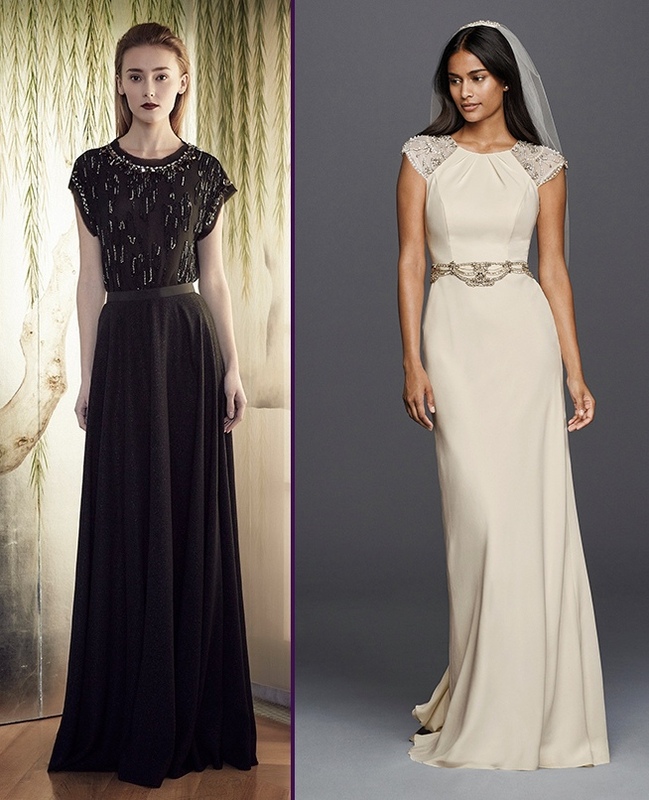 There are also elements in the bodice (not the skirt) that are akin to the dress below right, a gown from the the new collection Jenny Packham has done for Davids Bridal. 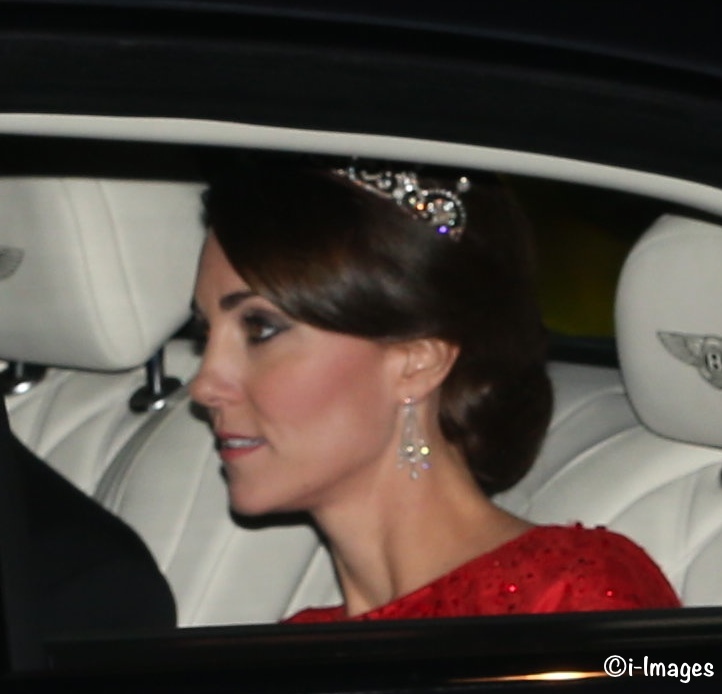 As many expected, Kate wore the Lotus Flower tiara, also called the Papyrus tiara. For tonight’s purposes we will go with Lotus Flower. Untouched by any impurities, the lotus symbolizes purity of the heart and mind and represents long life, humility, honor and tranquility. In Buddhism the lotus flower symbolizes faithfulness. The golden lotus that is mentioned in Buddhist sutras has two meanings; one is the symbol for the achievement of enlightenment and the other points towards a real flower which is beyond our normal perception. It is also symbolizes the complete purification of the defilements of the body, speech and mind, and the full blossoming of wholesome deeds in blissful liberation. The first person to wear the tiara was the Queen Mother, she had the tiara made from a necklace that was a wedding gift given to her by the future King George VI. This is the second time the Duchess has worn the tiara, the previous occasion was the Queen’s diplomatic reception in 2013. Kate wore two shimmering diamond bracelets this evening. The Royal Order of Splendor has more on the bracelet in this post. The Royal Order of Splendor tweeted that it looks like the other bracelet is actually a necklace that was converted into a bracelet. Below, you see Queen Mary, circa 1920, wearing the necklace before it was converted to a bracelet. This was an outstanding look for the Duchess. Not only did the dress look terrific on her, she seemed as relaxed as one might be at a function of this significance, at ease in her environment. Christin (@PackhamGown) on Twitter noticed that Kate had a red clutch, we haven’t yet found a photo of the bag. We’ll see you tomorrow morning for the creative industries event at Lancaster House. As others have pointed out, Kate was not wearing a royal order this evening. You may recall reports (also referenced in this space, I might add) that Kate was being given the Royal Family Order of Queen Elizabeth II. Madame Peng not wearing gloves is probably *not* a faux-pas in my opinion. From The Daily Mail’s coverage:”The dress code, which is outlined on the invitations, is evening dress (white tie), decorations, full ceremonial evening dress for serving officers, or national dress. It is intended as guidance, so guests are aware of what others will be wearing, and on occasion, some have worn black-tie instead.” Others may have better information and experience in this are than I, additional comments are always welcome. NOTE: In posts last week I referenced a post showcasing possible designers with Chinese links that Kate might have chosen to create a gown. Unfortunately events conspired to make that impossible, I apologize. Great website. Incredible photos. I am a believer! 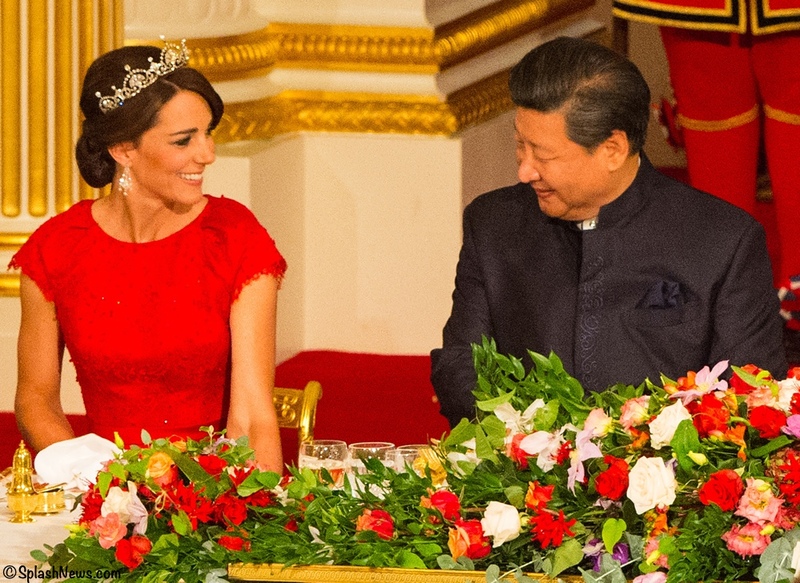 I think that the color of her dress is a nice nod to China’s flag color.The color suits her.She’s wearing the perfect amount of jewellery for the occasion and speaking of jewellery…how beautiful is that tiara! This may have been asked & answered: I noticed that in comments on the jewel related sites the significance of the Queen loaning Kate her Wedding Gift Bracelet for the event as it is a personal favorite and is often worn by the Queen on occasions. That said, have any other royal women been loaned that bracelet previously? I’ve seemed to notice that with Kate and even other royals, the Queen loans jewelry (and bestows other gifts) that are sentimental in manner. Most of the jewelry Kate has been loaned has been previously owned/worn often by Princess Margaret and the Queen Mother, their home in KP was Princess Margaret’s, etc . . . there’s even some sentimentality/purpose with the Jewels that Sophie has been given or loaned, as well relating to her title or other reasons. With Camilla, I don’t see that. She does receive her fair share, but she also has purchased (has had purchased) a vast array of her own jewelry. So it had me wondering if this was a loan of sentimental meaning. This is most certainly a bracelet that one would recal (both are, in fact) that they would make an impression if another royal lady had been loaned them. I’m not guessing that there are favorites, just that there is a sense of true family among them and that Kate is seen as an equally important member of the family as any other. Any insight to my thoughts would be appreciated! They sure are stunners and I’ll be looking for them on HM in the future! Most items in the Queen’s jewel collection have sentimental meaning because they are almost all inherited items. It would be hard to avoid the family connections. Of course the wedding bracelet is special so it does seem significant that she’s loaned it. I don’t think it has been loaned to anyone else before. A lot of Camilla’s jewellery was purchased for her by Charles. But she has been loaned many significant items by the Queen. The two tiaras she often wears were previously worn by the Queen Mother, as was her engagement ring. As for the Kensington Palace apartment, there are only so many apartments available since a lot of KP is now a museum. I don’t think there is any significance that Princess Margaret used to live there. Firstly, I want to say thank you to WKW for all the effort in keeping up such a high quality website consistently with such a lightning speed of updates! 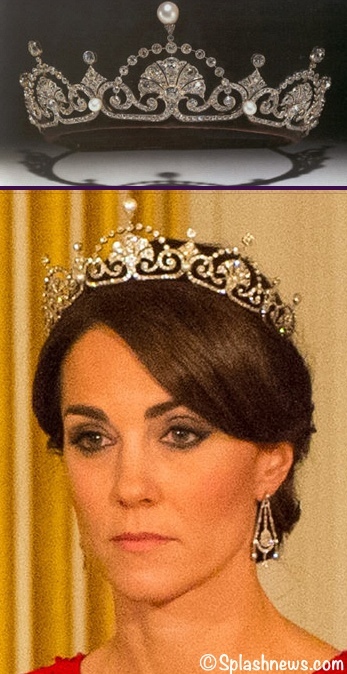 Secondly, I might have too high expectation of this tiara moment for Kate so honestly a little bit of disappointed. Everything is fabulous but we’ve seen the Duchess looked better before…and I don’t think she looked too serious or miserable, the Duchess looked just right for the occasion. I think it is her eye makeup that giving us such impression, if compare to her picture in the previous Diplomatic Banquet you might know what I meant. And I wish her hair looks better as well! I think she’s lining the inner and outer lash lines. That’s making the eye look appear too heavyhanded, imho. Will we ever get a look at the back of the dress? I had read a comment somewhere that the back of the dress was lace, but haven’t ever seen the back of the dress in a photograph. Does it show up in any video footage? Yes! This is exactly what a Princess (or Duchess) should look like! The diamond bracelets, the tiara, the earrings, the full gown…she is regal and royal from head to toe. I love Jenny Packham designs and think that Kate is always the most stunning when wearing her dresses. The red was a perfect choice. Someone earlier said that this look was “iconic” and I have to agree. She looks like a queen herself. Other than that I think the skirt of that truly gorgeous red dress could have been more fitted to Catherine’s stunning figure, she just looks deeevine! She has so “grown into” her role in the Royal Family I am almost speechless with admiration!! I think she looks gorgeous. Everything is perfect. Her dress is elegant and appropriately conservative for the occasion but the red color is youthful and is perhaps a nod to China since red has significance in Chinese culture. The amazing tiara and double diamond bracelets make up for not having an order to wear, lol. wonderful this am……in the “eggplant” lace dress……..I just like her…. I also think its a shame the Duchess was the only one without the blue sash and the queens order….my quess is she isn’t getting it anytime soon since the state dinner is over which would have been the perfect opportunity…she deserves it with out a doubt love the outfit…..not the hair with the tiara though…anyone know what shoes she is wearing???? First, just wanted to compliment a great and informative post. I know we love to gush over what our Kate is wearing, but always nice to know what they are doing and why. Good coverage! I loved tonight’s look. The times she has worn this shade of red of over the years she has always looked stunning. It is definitely her color. I do feel Jenny Packham was a safe choice, but a good one none the less. It makes sense, she did not need to bring out a show stopper since she was not the main event so to speak. I liked her jewelry choice, simple yet just enough glitter. Tiara choice made a lot of sense not only for symbolism but also for Kate’s style. Also, I am always fond of a good up do and tonight did not disappoint. Loved the side swept bangs. She looked stunning and for her first state banquet she did great! Anything on her earrings? They look gorgeous! They are apparently on loan from the Queen and she’s worn them a few times before (at the Diplomatic reception where she last wore this tiara, and in L.A. a few years back). I don’t think anyone has any info beyond that — the usual jewel blogs don’t seem to have identified them on any previous Royals, so perhaps they’re a rework of older pieces? Thanks! I was wondering the details of the earrings, too! I knew this was a Jenny Packham the instant I caught a glimpse of part of the top as the Duchess sat in the back of her limo on the way to the dinner. Something about the embellishment screamed “Packham”. It might as well have been embroidered around the collar. That said, I was a bit disappointed. The color was absolutely right for the occasion, and of course the Duchess wears red so well. However, I had been hoping for a more sophisticated and dramatic silhouette, and found this one, with its cap sleeves and full skirt, rather boring and unimaginative — conservative Disney princess in its effect. I would have been happier if the skirt had been slimmer, as in the Packham wedding dress pictured in the post. The Duchess’s tall, slender figure would have shown off such a design to great effect, as it did when she wore that knockout pale-pink and silver Packham not long after her wedding. Possibly the designer and her client felt that the color was the most important aspect of this dress, and I take their point, but I still think it could have benefited from more thought and attention given to its lines. I was pleased to see the Lotus Flower tiara, which I love. I think I commented on its last outing that I was hoping she’d wear it for her wedding. On the other hand, I’m not sure two wide diamond bracelets were necessary. Being of the “less is more” school of jewelry selection, I would have worn one, above the hand on which I was not wearing my quite conspicuous engagement ring. I very much like the Art Deco-influenced design of the Wedding Gift bracelet, though I note it was made decades after Art Deco’s heyday. Now you’ve made the comment about a slimmer skirt improving the look, I can’t unsee it – would definitely have been a strong choice. I think there is a pretty ridgid dress code here and bodice must be fitted and skirts full, dont understand how she got away with no gloves 12 button for a sleeve and 18 butttons for sleeveless mind you have no idea where you buy white gloves today? Yes, I loved the pink/silver gown Kate wore soon after her wedding. I am wondering why we haven’t seen it again? I found the full skirt grew on me — in a manner of speaking — when I saw a clip of Kate moving. The fabric was so light and flowing it took away the sense of heaviness, which may also have been exaggerated by such a flat tone of colour. Also, Kate has a problem with slimmer skirts as I feel the pink and silver Packham you mention demonstrated. It was slightly fuller at the bodice and with her slim hips it made her look a bit top-heavy, something I think today’s lace D&G was also tending towards. I’m also coming to feel that Kate’s natural caution in her taste in some ways helps her exude more class — as if she’s above mere vagaries of fashion and remains true to her reticent self. I thought the two bracelets worked — but only just. She was mercifully free of the Queenie excess of bling. It was odd to see two such heavy bracelets though I thought the Art Deco (almost) was right up her street. Good spot on your part about the date of the Art Deco heyday — comes with your job I guess! How beautiful! Catherine looked beautiful, as always. I love those earrings and the bracelets really polished the whole look. Her hair was beautiful and though I had hoped for a different tiara, the Lotus Flower was a good choice since the lotus is an important symbol in China. I do have to say once again that I feel that she plays it too safe in the choice of her clothing. I remember when Catherine wore the teal Jenny Packham and it took our breath away and I had expected to see something different at the banquet. The lack of an order has me intrigued. If it wasn’t worn it must be because the queen didn’t give it to her. But why? Diana got one the year she was married, Camilla received one within two years, yet Sophie’s was received in 2004, five years after her marriage. I had read once that they’re usually given within five years after marrying into the family and I suppose that Diana and Camilla received theirs earlier because Charles is the next king. Yet Catherine and WIlliam have been married four years, she has had two children and her first state dinner would have been an appropriate time to receive the order. I suppose we’ll see it happen sometime in the next year. I hope this comment doesn’t sound too negative. The reality, as I see it, is that Diana probably did in one year, about the same amount of work as Kate has done since she was married. This is not a slight on Kate. Different times, different experiences. Kate has had a very, very gentle introduction to Royal duties. Diana was thrown straight in. Also remember that when Diana’s engagements were being counted, things like showing up at Wimbleton or a rugby game were not considered engagement. I think the Royal family, and Charles in particular, realizes that Diana baptism by fire was too much and has tried to shield Kate much more (perhaps a bit too much in my opinion.) The consequence is that it will probably take Kate a bit longer to earn the Royal order. Kate is not in Diana’s position. She is married to the second in line, not the first. It is Camilla who is in Diana’s previous position, not Kate. That makes a difference as well. None of the royal young ladies of this generation have received the order. It seems likely that Beatrice, Zara and Eugenie would receive the order before Kate. 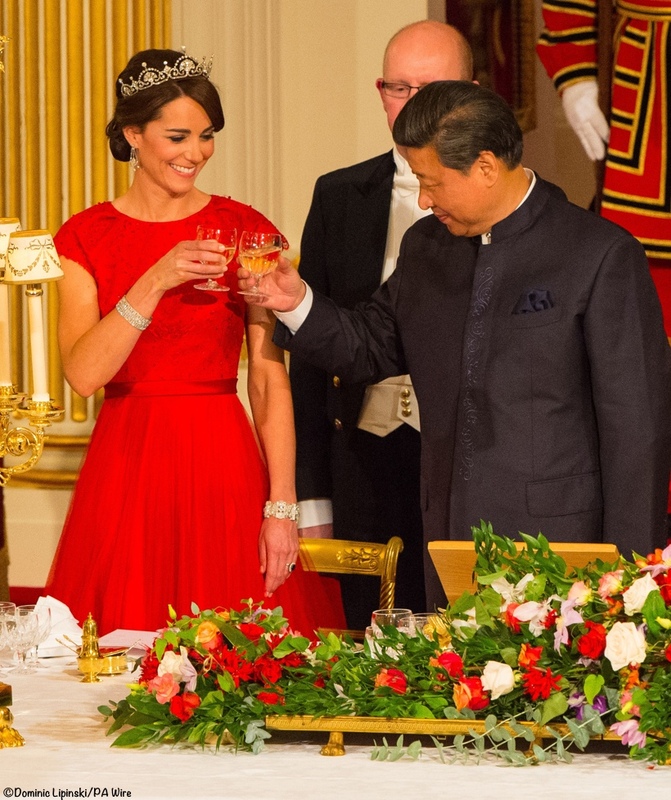 It actually makes sense to me that Kate wore a British designer as opposed to a Chinese one, as had been suggested. I mean, she is on British soil at this function. Had they been in China and she would have felt to display a nod to the local culture, then yes, it would have been surprising to do that. But I think since they are in the UK and hosting the event (as opposed to being guests) it makes total sense to wear a British designer. Thank you for the lovely and informative post! Perhaps I missed the reason…but where were Charles and Camilla? Why weren’t they in the spots given to Kate and William? It had been made clear that they were not going to be attending, that they would be taking the night off. Charles has attended many, many state dinners, since his 20’s, and he and his wife have been particularly busy with engagements lately. It’s also possible that he and the Queen may both have felt it was time for the Cambridges to start getting some experience with these events. The Wessexes have been given those particular seats at state dinners in the past. Charles and Camilla haven’t attended every such dinner given over the past ten years. As another commenter asked and I was too curious not to check her out, who is that gorgeous lady with the tiara and stunning gown at 18:02 in the video? Please find out for us!!! 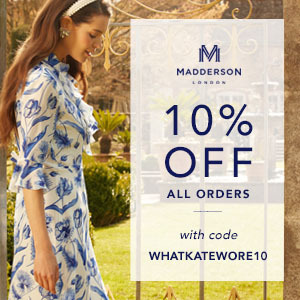 As has been mentioned further down and in other places on the internet she seems to be the Marchioness of Cholmondeley. You bring together so many interesting people with often highly knowledgeable perspectives on fashion in all of its aspects, including historical, long-term, economic and social implications. I especially like that the fashion aspect of Catherine’s life is being discussed taking into account the specific functions she is attending, her role/status in relation to the other persons present, the aim of an engagement, etc. I also appreciate how polite and respectful everyone around here can be even when being of very different opions. I, too, have wanted to know about this lovely lady and the spectacular tiara she is wearing. I checked back on this blog tonight specifically to see if anyone had answered the question of who she is. Does anyone have knowledge? I’m glad to know I’m not the only one who noticed this gorgeous mystery woman and her lovely tiara! On the fashion side, I loved everything I just don’t understand why won’t she wear her wedding earrings? I love how Kate choose to not accessorize with a necklace. When you are relatively small-framed like she is (and I am), too much jewelry up by the face can really overwhelm the frame. The tiara, earrings and bracelets were just right to balance out her frame. You can be tall as she but proportions are very, very important! I’m glad she went with red. I love the glitter sequin texture on the dress! It adds something special to the dress. In terms of gloves, I was taught (ye old military kid here. Many a formal event under my belt) that one only must gloves if it is a military ball, white tie with gloves (one usually denotes these things these days) or in an event where the card says, “gloves must be worn.” At least, that’s what I was taught. Times may have changed since the 90s/early 2000s. Historically, the reason for not seating spouses next to each other at formal events is because of the thinking that you see your spouse all the time- your goal at something like this (or a ball) is to interact with others. Then you both bring back the information and conversations you had and have something to share with each other. I do 1860s reenactment (the civilian side) and we do our balls and dinners this way. Balls you only dance the first and last dance with your spouse, and possibly one more out of the 18 or so dances we do. It’s period etiquette. I, also would like to say thank you for this amazing website and high-quality posts. Everything is always in detail and complete, even in the links section. I am sad to say, this is one of the only times I did not enjoy the Duchess’ fashion sense. This type of warm red colour does not flatter Catherine, nor does this neckline or sleeves. Remember when she wore a dress very similar in style in California a few years ago? It was pale lilac with a white belt and a boatline neckline and she was absolutely ravishing. I do love tonight’s tiara and earrings though, but Kate’s hairdo was boring and matronly and her makeup was just plain unflattering. She is looking kind of aged to me tonight, and not in a regal sense. Am I the only one who feels this way? This is the first time I have ever been disappointed by Kate’s look. Normally I am a huge lover of her style! I do understand she has to be ultra conservative in a setting such as this one, but I’m afraid I just didn’t think she looked her most beautiful tonight. I have to agree. We have seen this dress in lilac, teal, and red. Very slight modifications. I have to accept that Kate is not a risk taker. But a simple Silk Shantung silk would have been appropriate, the right weight for late October and also significant to the Chinese. The color is spot on but the sequins and usual waist and skirt of Jenny Packham is just not working for me. The other thing I don’t like is the two diamond bracelets. I was taught, only one statement bracelet, so that it pops. Two make the look cheap. And also hard to wear. I thought the hair and tiara were spot on. Sadly she seems back to her old makeup habits. I agree . I don’t understand why people say this red suits her when this shade of red clearly doesn’t – remember thatbeulah gown. And you are right in regards to the similar cap sleeve floaty gown in LA which was perfection on her .I don’t like the dress on its own either – it’s lacking design elements and looks like a bridesmaid outfit. Yes, the gown Kate wore in California was gorgeous. Wonder why we haven’t seen it again? I like the cut of the dress and I especially love the wedding dress version. Kate’s a beautiful woman, but I wish she would wear less eyeliner. I think using less, especially under her eyes, would brighten up her face so much more. I agree with all your points. I’m especially not a fan of the matronly hair-do here. She looks tired (probably due to 2 little ones at home) and when you’re not looking really well, red it one tough color to pull off! I adore Kate, but I have to agree with many others here. It is not that red does not suit her, it is this specific shade of red that does not look good on her. Kate has a great figure; she should wear “slimmer skirts.” She looks tired and older than her years. I think the hairdo is too matronly, and unfortunately she went overboard with the make up! Her eye make up is too heavy and dark! Her lips are too “severely” lined. The entire effect is aging! I have read that Kate likes to do her make up herself, but I think that she should hire the services of a professional and experienced make up artist (at least for a few lessons!) Kate is too young to look so aged! The two bracelets are fabulous, but one on each wrist is overkill! In my opinion, one was more than enough! I like the lace dress and the shoes. I think Kate’s hair looks lovely and her make up, this time is fine. But, I think that this lace dress was not correct for the occasion! A nice suit or another style of dress (in a different fabric) would have been more appropriate. This is by far the prettiest dress I have ever seen her wear she looks like a true princess just glorious and radiant wow and I love her hair! She is gorgeous! I think that Kate looked wonderful. The colour suited her to perfection and was the right choice for the occasion. Her jewellery had the wow factor but wasn’t too overwhelming for a younger person. All in all a great look for Kate. It’s so nice to see her in formal wear and jewellery instead of the smart but casual looks we are more used to seeing. Disappointed. The colour of Kate’s dress was really lovely. The dress though managed to swamp her gorgeous silhouette especially the top half and those cap sleeves? Her hair appeared as if no one knew quite what to do because of the long fringe and this was the best outcome. A half updo would have injected youth and stand out glamour. Instead the duchess ‘fits in’ I wanted so much to go ‘wow’ with Kate I didn’t. Instead when I saw Madame Peng Liyuan I went ‘wow’ tailoring and colouring of this lady’s gown was perfection. She also radiated confidence, poise and glamour. Kate doesn’t yet have that air of self. She’s present, beautiful, does as she should and leaves. I think she will in time acquire such a presence. The Queen’s brooch did not appear on her left shoulder but in fairness this was based on speculation and no doubt will appear in due coarse. Madame Peng was the guest of honor, Kate was not. It was Madame Peng who should have stood out. Kate and those who advise her on wardrobe for such events would have known that and planned based on that. I’ve been so busy the past few months I haven’t had time to stop into WKW to see what my favorite royal is wearing these days. So imagine my delight when I logged on tonight and found a wonderfully detailed article about Catherine’s first state banquet! The dress was perfect in my opinion from the color to fit to design. She is spot on picking out jewels (or has an outstanding advisor). Those bracelets worked perfectly with each other and the red dress was an ideal backdrop for them. My only question/concern is why does she look so very serious in so many of the photos? I thought she looked positively miserable. I truly hope I’m wrong because she has a lifetime of state banquets to look forward to. I suspect she’s already growing out the bangs. It takes some trickery for them to work with a tiara. This was a nice look. I notice her fringe as well, it looks like its getting long enough to be tucked away, though I think it’s been helped by the side-part which is using a longer layer to keep the shorter ends out of Kate’s eyes. I hope we shall see it all away before too long. Guys, I have a rather different question. Who is that beautiful lady in the grey gown at 18:02 with the striking tiara? Do you know who she is? Is she from the royal family? A lot of ladies are wearing tiaras in this banquet. Kate looked gorgeous with a capital G!! Necklace not necessary. The two bracelets and the tiara were enough. I noticed a lovely woman in a grey gown who looked very 1920s, art moderne/nouveau-ish. She was pictured twice in the video, and sat to the right of Prince William on the adjacent perpendicular side. Her dress of a grey bodice with sparkly arms was very pretty, but it was the tiara and updo that did it. No idea who she is! I didn’t recognize her and she looks quite young. I did some googling to see if I could find anyone on the outer edges of the Windsor family that looked 20 or so. She could maaaaaybe be Flora Alexandra Ogilvy from the Kent branch of the Windsor family. Or she could be the daughter of some other random nobility. Now you’ve piqued my interest and I want to know who she is too! Ah well. Here’s hoping someone else can ID her. I have been wondering about that woman too! She was lovely, and her tiara looked a lot like a crown of roses. It’s rumored she’s the Marchioness of Cholmondeley.. I think you are right – I google imaged the name, it looks like the same woman! Fabulous post, thank you! I suspect we will we this tiara many more times in the future. Diana had two tiara’s she wore regularly – the Spencer and the Cambridge Lovers’ Knot. I think the reason for this is that they need to be fitted to the head of the wearer in order to be comfortable. This one probably fits Kate well and so I imagine she will continue to wear it. It will be interesting to see if she interchanges it with her wedding tiara or if her second go to one will be something different. Both tiaras are on loan from the queen. Kate doesn’t own either of them. I suspect she’d continue to wear this tiara to tiara events though because clearly it’s one HM doesn’t mind loaning out to Kate. The Swedish royals switch up and share tiaras a lot (because many of them belong to the family foundation vs actually belonging to the individuals), so I don’t think it’s a matter of fit. It’s more a matter of what the queen is ok with loaning out to Kate. I wish we got to see Kate in a tiara more often! i, too, watched the live coverage (4am in my part of the world). lovely look in general, love the jewels. any info on shoes? all out for the chinese delegation, excellent move. trade with china is headache but if you get it right, benwfits dor everyone. madame pang is also lovely, i like her belted gown. Merci buckets for the pingback, ma cherie! 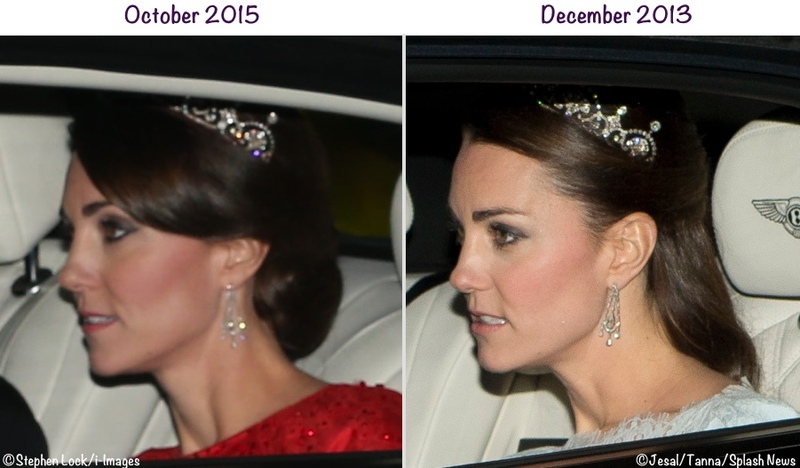 It’s interesting Kate wore the same tiara twice. True, it is thematic and it’s got that “starter tiara” history like the Cartier Halo Scroll but I can’t help but ponder if Kate just has a preference for it. [PS – is it me or is Kate starting to look like Letizia? I am pretty positive that Kate does not get to choose her tiara. That is normally something the Queen picks out. 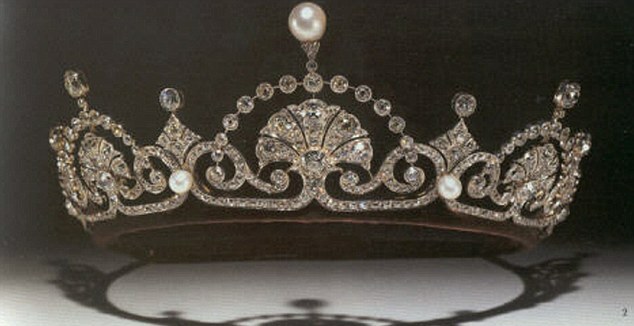 So it seems like this tiara is the one the Queen has decided is Kates for the time being. I agree with you, ElizaMo. There’s no reason to believe that the Queen picks out the tiaras and then imposes her choice on the prospective wearer. That has never been suggested in anything I’ve ever read on the subject of the Queen and the royal jewel collection. On the contrary, the word on the Queen is that she’s rather indulgent with her relatives and tends to go along with their preferences. I have no doubt that the Duchess has chosen the two tiaras she’s worn. I am absolutely geeked out at the sight of the Duchess in a gown and tiara. So regal and elegant. I love her in red. Thanks for the post, I always appreciate the level of detail you provide here! I thought the Duchess looked lovely, though I’m curious about her choice for cap sleeves on the red gown. The cap sleeves make her look quite young and seem almost a bit informal for such an affair. Both the queen and Premier’s wife were wearing longer sleeves, in contrast. I would love to hear others thoughts on this! The color of the dress is so intense…I think the cap sleeves soften it a bit. I wonder if bright red from head to toe would just be overpowering. Also the high neckline with long sleeves might start to look severe. Just my thoughts. 🙂 I think the sleeves and bodice and the shape of the gown are just exquisite! HM doesn’t like women to go completely sleeveless. That would explain the cap sleeve. Also, I just want to expand on this, not only does the HM doesn’t like sleeveless, but it is improper at a white or black tie affair to go without sleeves. This is why you often do not see wedding dresses that are sleeveless–or worse, without some form of straps–among royal or even high society weddings. It is considered taboo. I have to disagree here – HM wore many sleeveless and strapless dresses for black/white tie events in her younger years. E.g. 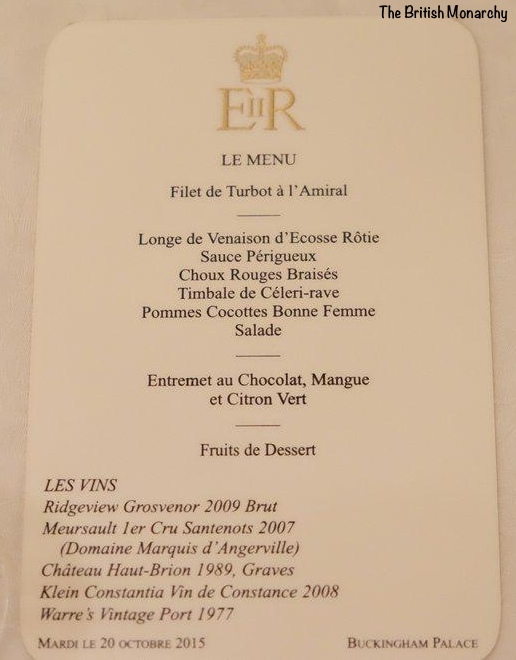 for a state banquet at the French Embassy in 1950 and for a dinner with Kennedy at the Palace in 1961. Kate has attended black tie events in sleeveless dresses too. Royal wedding dresses are modest but this is for modesty/respect in church and this would not apply to a state dinner. As a young woman, the Queen not only wore sleeveless evening dresses, she sometimes went strapless. She doesn’t dislike sleeveless designs. The cap sleeves struck me at first as being a bit like traditional Chinese dress — just a passing reference since the full skirt is clearly western! Dress, jewelry, hair: well done. Eye makeup: overdone. And I don’t agree that she looked comfortable; in the pictures where she’s not specifically interacting with someone, her face reads as uncomfortable. She’s trying to maintain a blank face and looking bored in the process. I thought she looked a bit strained as she did at the wedding especially when she made that awesome walk up the aisle. These are big occasions and she has to get everything right in front of a lot of people! Yes! I think she was trying to keep a neutral face and at times it read as bored. Think of the pressure she’s under at these functions, and she’s literally one of hundreds of people there and yet all eyes (and cameras, and commentators) are on her, with just a passing description/look at what the Queen is wearing. I mean, if she sneezed it would be world headlines of the unflattering kind. Personally, I would find this sort of event very stuffy and boring without a clue as to what to chat about (I’m sure she got coached on that, but still…. ), but that’s also my personal feelings clouding my judgement. It’s a good reminder of the other, non-glamorous side of royal life. At least William has been coached for this his whole life. Kate, on the other hand, not-so-much. I thought she looked quite lonely up there on the top table with two Chinese gentlemen on either side, including one of the most powerful men on earth who proceeded to read his whole speech in Chinese! I wouldn’t want her job for, er, all the tea in China, and I so respect her for taking it on. Also of course the cameras are on the whole time and they only have to catch one second when her face is in repose to claim she looks glum. I agree that she looked bored. But then I looked at everyone else and they looked pretty bored too. The makeup though – WHY?! – she has access to the best makeup artists in the world, yet her makeup looks terrible. Kate looked every inch a Duchess tonight. I agree that it’s the jewelry which really makes this look resplendent. Susan, sensational as always. 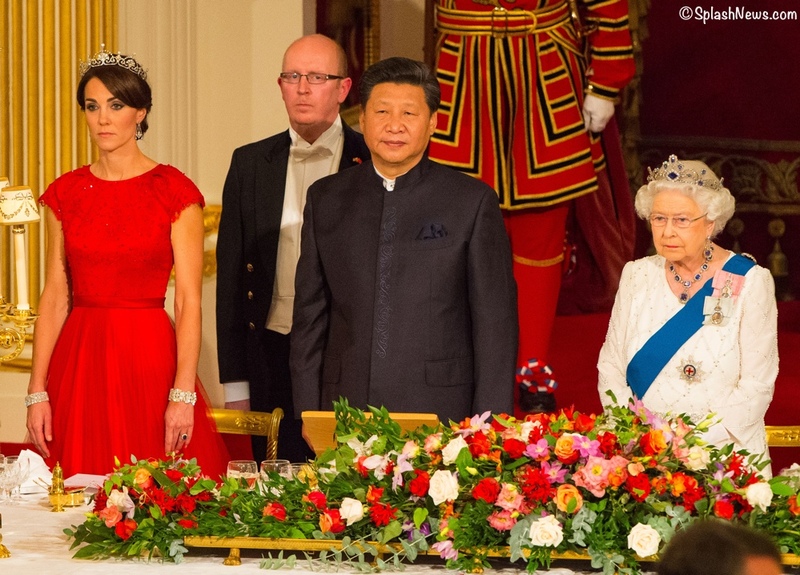 Although I sometimes wish the Duchess could be a little more daring in her dress, this ensemble seems pretty much perfect for a state banquet where she is sitting next to the president of China. She would have made conversation with him for at least one course, possibly two. As I understand it, the UK has a real interest in establishing a better commercial relationship. No pressure! 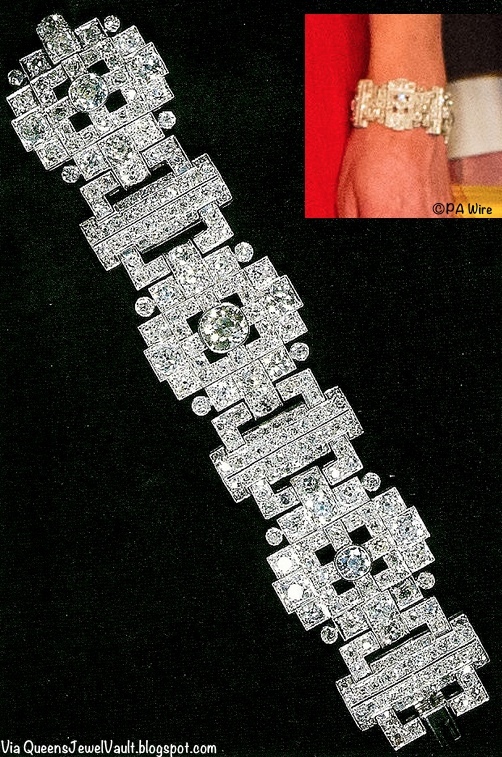 The ID of the bracelet came quite a surprise, because of it’s provenance from Princess Alice’s tiara, to Prince Philip, to his wedding gift to the Queen. That was a bit of a surprise. I can’t help wondering if Kate would have been cold. The Queen is in long sleeves and of course all the men are too. Surely either everyone else in the room would have been sweltering or Kate would have been chilly! The Queen was dripping in diamonds and sapphires. There was no way a dress of any color would have upstaged her in my mind. I think the red made what could have been an extremely demure dress eye catching. I wish we’d gotten to see her in a different tiara too. Specifically I was hoping for the Strathmore Rose Tiara (http://orderofsplendor.blogspot.com/2011/03/tiara-thursday-strathmore-rose.html), but alas. It seems that the Lotus is the tiara that the queen is willing to lend out, so that’s what we’ll have to settle for. 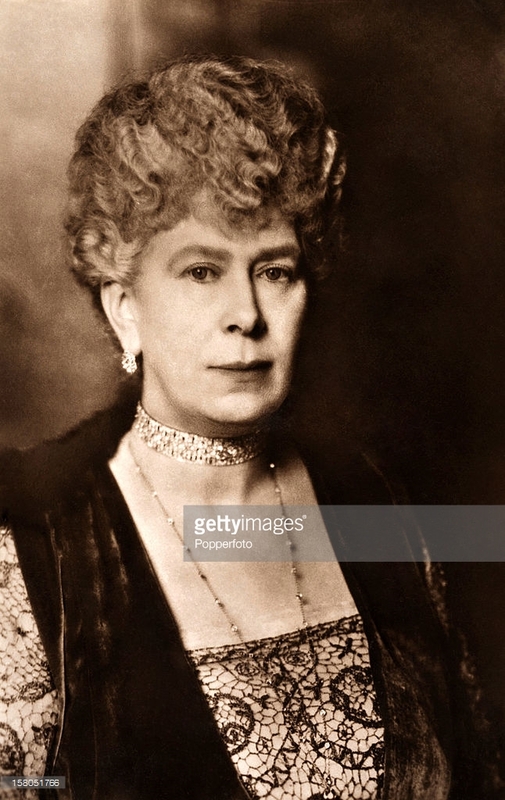 Just a small comment – I don’t think you’d call Queen Mary “Queen Mary of Teck” – I think she’d just be Queen Mary (of the United Kingdom) or Mary of Teck. She was born “of Teck” and is still remembered by many as Mary of Teck, however adding “Queen” to that would be like calling Queen Elizabeth “Queen Elizabeth of York.” Thanks for compiling so much information into your post – very informative! I loved the dress and the tiara. The two together, and for the Chinese state visit are perfection. I loved that she added some big diamonds for this…I’ve been looking forward to her wearing some jewels from the royal vault. However, I do think here eye makeup was a little heavy. Perhaps it was just the blurriness of the photos, but it seemed to age her tonight. Two things I was looking for though that we didn’t see: I had expected her to be wearing the Royal Family Order of QEII. I realize it was all conjecture that she had been given the order though. Or perhaps it simply wasn’t debuted tonight. Also, I thought that white gloves were de rigueur for state dinners at BP. Any thoughts? She looks lovely and I find it quite significant that she is on one side of the guest of honor and the queen on the other. That is a very prominent position and the Duchess seems very at ease. Love the red dress and all the jewelry. Just perfect. They alternated boy-girl. Kate is married to the second in line to the throne. There was no other female above her there so I think it was more logistics than prominence/significance. Had Camilla attended with Charles, Kate and Will would have been further down. It’s always the highest ranking female there after the Queen. Which tonight meant Kate. I half wondered if being so close to the Chinese president was a way of making up for her absence on William’s official – but solo – visit to China. Loved this look! I was surprised to see that she wasn’t wearing a Queen Elizabeth II royal order liked you mentioned might be the case in a previous post! Thanks for the updates! I enjoyed your posts leading up to the state dinner on the etiquette of attire, and especially enjoyed the link to Rita Wilson’s description of her preparations. 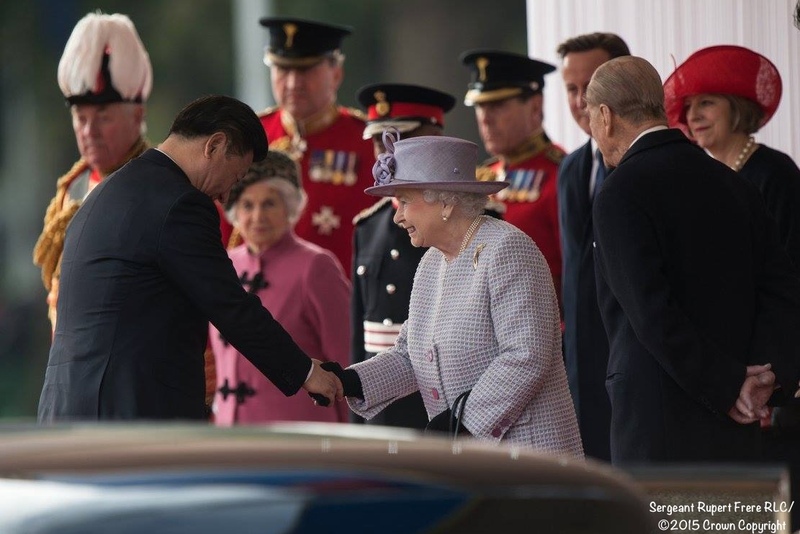 I can’t help but wonder why Madame Peng seems to have not worn gloves in the receiving line (photo here: http://www.dailymail.co.uk/news/article-3280557/The-Queen-David-Cameron-greet-Chinese-president-Xi-Jinping.html#i-c8e0360b92fb5ac0). Do we know if she didn’t wear gloves at all? Is this bad form on her part? Is it acceptable because of her position? So curious! I love the idea of fashion as diplomacy, and I think this is such a stunning example of wearing pieces that have cultural resonance, from the Lotus flower tiara to the choice of a red but relatively demure gown. I too don’t love the earrings, but they work with the overall look. A pretty wow debut on the state dinner stage. I know this is a blog about Catherine, but I have to add HM looks especially lovely as well. That sapphire tiara is a truly amazing piece, and she carries it beautifully. Somehow an amount of jewelry that would look overdone on just about anyone else suits her perfectly. Kate’s elegance and grace shone out in true style tonight and she acheived an utterly regal look and demeanour. The wonderful rich tone of red she chose looks wonderful on her and I can well understand her sticking with a go-to trusted designer. The detailed bodice, narrow belt and full flared skirt echo the teal Packham she wore before and are skilfully reworked here. And we have had a real treat in the bling department. It’s wonderful to see her hair up and smoothly glossy and above all to have the tiara clear out in the open and not shrouded in hair as it appeared to be on its first outing. I’m deeply impressed too that Kate managed two such awesome bracelets — looks like she may be getting into the bling thing. I’m glad they aren’t worn over gloves as the Queen so often does which feels too fussy to me. This evening has brought home to me how a lighter delicate touch works best for Kate, it suits both her preference and her proportions. She could easily be overwhelmed by heavier choices. All-in-all stunning outfit. Your analysis is spot-on, Eliza Mo – I agree with every word. A stunning look for the Duchess. Catherine looked stunning! Her hair was so pretty in that updo and looks as though it’s a bit darker. Not my favorite earrings at all. The JP bespoke red dress was just beautiful, though not outstanding simply on its own. The tiara and diamond braclets on each wrist are what changed the entire look from just beautiful to iconic! Overall it is Catherine’s most Royal look yet, aside from her wedding! I agree. I think the jewelry made an unremarkable dress remarkable. The dress was a canvas for the jewels, in a way. Agree 100%…Simple dress on its own, but when the bling was added, AMAZING!!!! Totally agree with the word “canvas.” The dress was a stunning canvas for the rest of the look. To me this look is a perfect example of her style at its best – simple, well tailored, elegant, and confident. Her look tonight will look just as amazing in 10, 50, 100 years. She knows what she’s doing. First, can I just say how much I appreciate this website and the quality of your posts? I have found myself refreshing this page on days Kate has an event scheduled (I am sounding slightly stalker-ish now, but she’s the only “celeb” I follow I swear! 🙂 and am always so excited to see your super-prompt updates. I loved tiara re-cap post and was really excited to see which one Kate decided on. I admittedly was hoping to see her in one that had been in the vaults for a long time; but this is a girl who is consistently classy and appropriate. I’m sure there was lots of reasons for her to recycle the jewlery and Lotus tiara (Oh, to be able to recycle tiaras…), and I’m guessing maybe one was the fact that she was wearing that stunning red! A red formal gown + a “new” tiara + new jewels may pushed us all over the edge 🙂 I think she’s too demure for that, especially when two seats down from the Queen. Lovely, lovely, lovely as always.